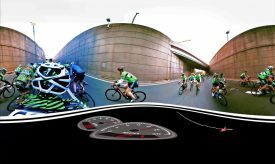 NEW YORK CITY, September 2, 2016 – GFNY has partnered with Sprocket Films and Car of Tomorrow to create a Virtual Reality (VR) film of the 2016 GFNY New York City Championship. For the first time, would-be riders can feel for themselves what it’s like to ride the course – an unprecedented, immersive video experience for a mass-participation sporting event. The video will be exclusively released together with Campagnolo at Eurobike on September 3. It will be available for everyone to watch starting September 5 at gfny.com. “VR is the buzzword on everyone’s lips these days, but until now we haven’t seen VR used in a mass-participation sporting event,” says Alex Bruskin, owner of Sprocket Films and producer of GFNY’s official videos. GFNY’s VR is formatted so it can be watched on a smartphone (with Youtube app) or on a computer using the Google Chrome browser. As with any new technology, there are challenges and limitations, but the possibilities are also game changing. There are four key challenges of making a VR video interesting for the viewer. Firstly, often VR feels a little “remote” since VR cameras are by necessity wide-angled; this makes all but the closest subjects feel far away. Secondly, the viewer doesn’t know where to look and can get disoriented pretty easily: is the action in front, behind you, or overhead? It’s a totally new problem for the filmmaker, who is normally able to direct the viewer’s attention by framing the shot with clear intentions. With VR, the viewer herself has to choose where to look. Thirdly, there are challenges with the current camera technology. “The VR camera is actually an array of six separate cameras mounted together, all shooting in fixed directions – it looks a bit like a high-tech pineapple,” explains Bruskin. Lastly, if the viewer is fully immersed in a VR environment for too long (around 20 minutes or so) there can be significant issues with nausea, disorientation, etc. Camera stability was the biggest challenge. Mark Smith, GFNY’s veteran cameraman, who risks his life every year shooting the race action off the back of a motorcycle had the idea to shoot the VR. He designed a special rig for the VR cameras that was constructed from a Stedicam vest with a camera mount on its back. Smith ran numerous tests to balance the tradeoff between keeping the cameras stable and high enough so you weren’t just staring at the back of the rider’s head. The project was taken on with the assistance of VR tech Chris Warner and experienced cyclist Mike Smedes, who was willing to ride parts of the course with an eight pound camera rig on his back, trying to keep as steady as possible, not interfere with the other racers, and simultaneously not crash. GFNY is the global cycling marathon series with events held in NYC, Italy, Mexico City, Indonesia, Cozumel-Mexico, Argentina, Colombia, Uruguay and at Mont Ventoux-France.